What do car seat headrests have to do with Inno Advanced Car Racks? Takaaki Murata, the worldwide inventor of the former, is also the designer of the later. Which means he knows something about INNOvation. Since 2003, Inno Advanced Car Racks and cargo boxes have been available in the United States and since then dealers have discovered Inno products' ease of use, attention to detail and excellent price points. Plus, Inno doesn't complicate its product line with dozens of SKUs. 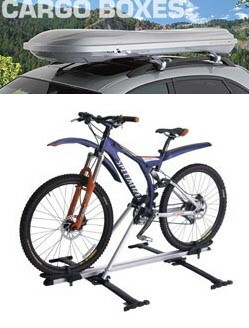 The company offers just a handful of bicycle racks and five cargo boxes (each in two colors: black or silver), so IBDs don't have to stock unnecessary inventory. The Upright's light and strong anodized aluminum tray fits square, round and almost all factory crossbars. The rack features a new and innovative caliper holding system that will secure tires up to 2.7" wide and bike frames to 3.25" in diameter. Includes key locks. This disc brake-compatible rack will fit square, round and most factory crossbars, features a strong and light anodized aluminum tray and boasts an oversized quick-release lever for easy and secure loading. Inno Cargo boxes include the Ridge Wide, Ridge Box, Stream Box, Air Cruiser and Low Down Cruiser. Each cargo box features 3-layer ABS construction which makes the box both rugged and beautiful with a smooth, glossy finish; a safety lock system which requires the cargo box to be locked before the key can be removed; and universal mounts so that every Inno cargo box will fit most aftermarket and factory crossbars. Between the five models, Inno has a cargo box that is perfect for almost any vehicle and any carrying space and load. Inno boxes are sleek for great aerodynamics and come in two colors: black and silver. "Inno is excited to be working with Lexco and expanding our products and brand name," says Alex Connelly VP INNO Advanced Car Racks. "Lexco's strength in developing and supporting the bicycle retail market is instrumental to our success as a company and as a manufacturer of bike racks, 2 & 4 bike hitch products, base racks, seasonal sports attachments, plus cargo bags and cargo boxes. "With Headquarters in Japan and USA, INNO Advanced Car Racks is a division of Car Mate MFG. CO., LTD., a 40 year old company. Our founder believes in quality of product, superior customer service and the need to develop exceptional products that support the end-user's travel and sporting activities. All INNO products come with our Universal mount which support square, round and factory cross bars." Says Karen Peterson of Lexco: "What we like about Inno products is their simplicity yet great innovation. IBDs like Inno because of the company's streamlined SKUs and dead-on pricing." Check out the complete line Inno Advance Car Racks products in Lexco's free 2009 Catalog. For details, call Lexco toll-free at (800) 626-6556.